In our last post, we showed you how to alter skirts and dresses to suit your petite frame. While Jeetly clothing is created specifically for petite figures, meaning an alteration-free experience, high street shoppers will often be required to make adjustments to their clothing in order to achieve a flattering fit. This time, we’d like to show you how to adjust tops and trousers so you don’t have to compromise on style anywhere in your wardrobe. Ill-fitting trousers can be a real problem when it comes to trying to look professional in the workplace. Petite women can suffer from trousers that are too baggy, too long or both! We’ve got a few tips for you to try so you don’t have to sacrifice your style! Before you begin, make sure you check the care label: If it shows that the fabric contains cotton or rayon, pre-wash your trousers to allow for shrinkage before you hem them. For jeans, pre-wash TWICE before hemming. 3) Cuff the trouser by folding the trouser fabric up and inwards (inside the leg) to the correct length and pin all the way round the leg. 5) Make sure the pins stay in place and sew the new seam. The best sewing technique for hemming garments is a blind hem stitch, which you'll need to look up if you don't already know what it is. 6) Iron the hem to finish and smooth any old fold lines. This one comes with a warning. While slightly shrinking your trousers can help the fabric to appear more fitted on your frame, there’s also a chance that the trousers may be misshapen! Baggy sleeves can be a petite woman’s worst enemy when it comes to choosing a new blouse or shirt. Often, if the body and shoulders of the top fit perfectly, the sleeves will be too long, too wide and the armholes will be too large. Solve your sleeve problems with these tips. 2) Turn the top inside out and lay flat. Mark (with chalk or fabric pen) one continuous line from the sleeve opening/cuff toward the armhole and down from the armhole towards the side seam of the top. Stitch along this line using a machine or sew by hand. 3) Knot the thread or backstitch (if you are using a machine) to secure. 4) Flip the top back the right way and iron the seams to smooth the area. Try it on for fit. 5) If the fit is correct, turn the top inside out again, trim the excess material. If the fit still needs adjusting, undo the seam and start again with the correct measurement for the seam line. 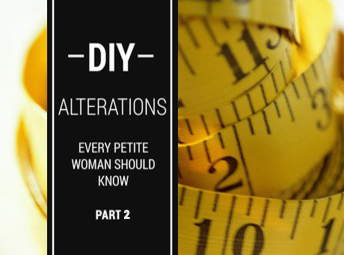 We hope our alteration guidelines are helpful! For petite clothing that fits right every time, check out our Jeetly petite women’s clothing.